This week our economist Kyle Pomerleau has a new study on how individual tax rates have a big impact on U.S. businesses and economic growth. 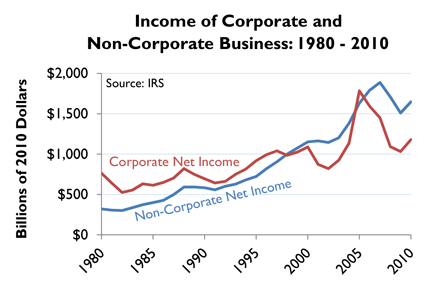 As Kyle points out, the number of small firms that are not subject to the corporate income tax has been growing significantly in the last 30 years, so much so that the majority of business income in the U.S. is now taken in by these so-called "pass-through" business entities. The income from these firms is passed through to their individual owners, where it is then subject to the individual income tax, which currently has a top rate of 39.6%. Most pass-through income is taken in by individuals who are subject to this top rate, thus giving smaller businesses an even higher tax rate than U.S. corporations – which already are taxed at the highest rate in the developed world. Kyle appeared on Fox Business last night to explain this effect.